"I'll be there at 7:45am" I muttered to myself as I turned the car around in the dirt parking lot. Damn social media! Before technology, they probably would have had a few pints left when I rolled in after work at 1:45pm. Unless they sell out, the farm stand is open until 2. But not today. Not a berry left by 12:00pm. Tony Andrews Farm didn't even post on Facebook until 9:00am, an hour after it normally opens, and it's Friday. Most people have already gone to work or about their busy lives. How could this be? And tomorrow is Saturday!! I've got to get here before the throngs of native Cape Cod strawberry freaks, like me. You may think my behavior a bit extreme. But I've waited all year for these particular strawberries. The growing season here on the Upper Cape is shortened by the cool ocean breeze and I've been counting the days since June 1st. These singular berries are perfect in every. So sweet, red and juicy. The stuff that strawberry dreams are made of. Picked at the peak of ripeness, ruby red on the inside, tangy, warm juice running down my hand and arm as I take a bite. Half the basket is gone before I can get them home. Ever since I was a kid living down the street from Tony Andrews Farm, I have felt territorial about these particular strawberries. So much so that I hesitate to write about them at all and let the secret out to anyone else who may however unintentionally keep me from my over the top, gluttonous share. Which is not at all a fair allotment but the amount that I truly feel I need. I must get enough for multiple large batches of jam, to fill my freezer, to devour strawberry shortcake, strawberry rhubarb pie, strawberries and cream, strawberries macerated in balsamic vinegar dribbled over vanilla ice cream...... I could go on and on. 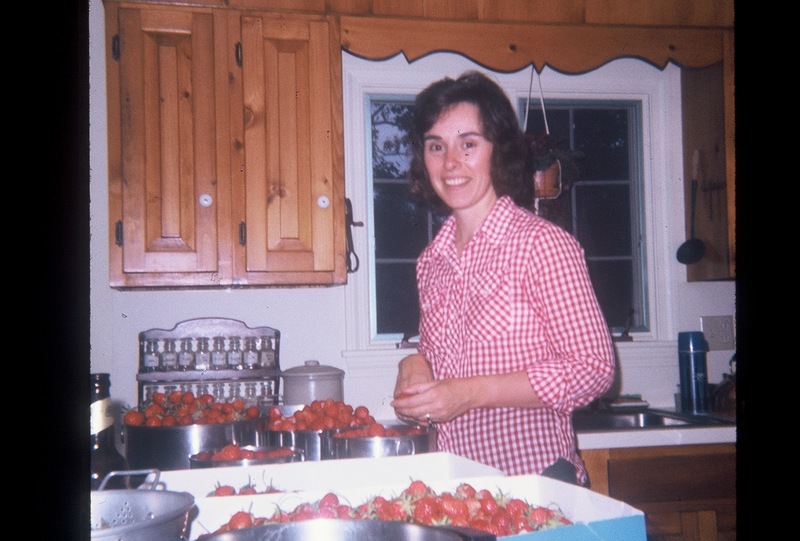 Perhaps I am trying to recapture those fond memories of picking strawberries with Val. Fighting with my sister and brother in the designated "Kids Patch" (meager pickings) while my mother filled large baskets and Tupperware containers to take home her own haul. We got up early to be first in line and pick as much as we could carry home. Later in the day, Val worked tirelessly, hulling each berry. Freezing whole washed berries on cookie sheets and boiling batches of sticky jam filled with large chunks of sweet goodness like hidden treasures to find inside a school lunch PB&J, my tongue feeling the nubby texture of the strawberry seeds dotted in it's soft flesh. She macerated sliced berries in one of her silver metal mixing bowls with the ring attached by dumping a heap of sugar on top and leaving them to do their thing on the kitchen counter for a few hours. Those were to adorn the Bisquick shortcake that was baking in the oven, topped off with a dollop (or two) of fresh, cold whipped cream. But the best part, was always when Val paused for a moment in the middle of all that shucking, berries heaped high in bowls around her. She stopped to examine an utterly perfect berry, with a flick of her metal paring knife, she gently removed the tiny green leaf cap. She looked up at me, smiled and popped it into her mouth. Here is a basic recipe for strawberry shortcake. You could actually use any berry you like. Also, this recipe does not include Bisquick. However, you can never go wrong using the recipe on the back of the box. Slice strawberries into a large bowl and top with 1/2 cup sugar. Mix gently. Cover and allow to sit at room temperature for about 1 hour or more. In a large bowl, mix flour, 1 tablespoon sugar, baking powder, baking soda and salt. Add butter pieces and combine with pastry cutter until mixture resembles a coarse meal with small pea size chunks of butter still remaining. Combine 1 cup buttermilk and 1 teaspoon vanilla. Make a well in the center of the flour mixture and slowly add the buttermilk mixture while gently stirring to combine all ingredients. Do not over stir! Dollop 12 scoops of the batter onto lined cookie sheets. (Use the type with a rim as the butter can melt and cause a problem in the bottom of your oven!) Gently brush cakes with 1 tablespoon buttermilk and sprinkle more sugar on top. Bake for 12-18 minutes until edges and tops are golden brown. Remove bicuits from cookie sheets onto wire rack to cool. Add whipping cream, 1/4 up sugar and 1 teaspoon vanilla to the bowl of a stand mixer. Cover the entire situation with a dish towel. Mix cream on high for about 2 minutes until cream forms soft peaks. Break 1 or 2 bicuits into a serving bowl. Top with desired amount of strawberries and juice (I like a lot of juice to absorb into my biscuit!) Finish off with a few dollops of whipped cream. Savor every bite! !